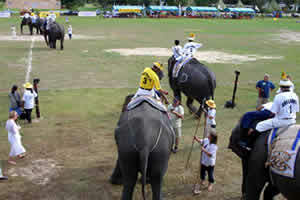 Bangkok, 23rd July 2002 -- The ancient sport of Elephant Polo is being revived once again this year when the second King's Cup Elephant Polo Tournament takes place in Thailand's seaside resort of Hua Hin from 17th to 22nd September, thanks to an Englishman, a Scotsman and a Swede. Polo playing Englishman Jim Edwards and Scotsman James Mann-Clark resurrected the idea of elephant polo in 1982, but it was Christopher Stafford, a Swedish polo player and general manager of Hua Hin's Anantara Resort and Spa, who brought the tournament to Thailand for the first time last year. Played according to World Elephant Polo Association (WEPA) rules, the Hua Hin tournament, will feature teams from Nepal, Sri Lanka, Australia, Singapore, Dubai, Thailand with top players from Argentina, Germany, UK, US and the nation countries taking part. The tournament is supported by the Tourism Authority of Thailand and the Thai Elephant Conservation Centre (Forest Industry Organisation). 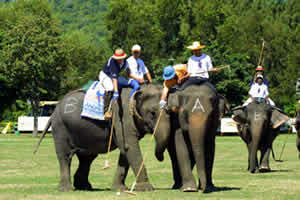 Elephant Polo is played with two teams of three elephants and two 'chukkas' of ten minutes playing time. 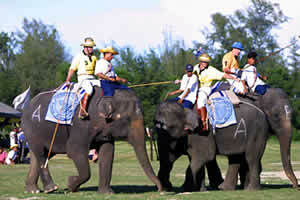 Each elephant carries a polo player and a mahout. While the mahout directs the elephant using his voice, hands, feet and goads, the game's umpire sits and oversees the play from a wooden howdah on the back of the largest elephant. The majority of the players are keen horse polo players. However, "being adept at swinging a polo stick on a 40 mph galloping horse is scant preparation for sitting atop a two and a half metre elephant moving at 15 mph whilst trying to knock a regular sized polo ball with an elongated polo stick", comments tournament organiser, Christopher Stafford. There is also the issue of elephant dung, which can cause etiquette problems if the ball lands squarely. WEPA rules deem that the ball can still be played so to avoid any ungentlemanly mess, rules allow for a jumbo pooper scooper to run around the pitch and keep it free of jumbo debris. Headquartered in London, the WEPA rules make provision not only for play but also for post match refreshments, stating: "sugar cane or rice balls packed with vitamins shall be given to the elephants at the end of each match, and a cold beer or soft drink to the elephant drivers and not vice versa." 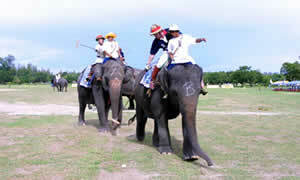 Elephants for the tournament are provided by the Thai Elephant Conservation Centre, in whose aid the event is held. Last year Baht 381,000 (approximately UK£7000) was raised for the centre, which cares for elephants and raises awareness for the plight of the Thai elephant. "Thailand's 2500 domesticated Asian elephants are the only survivors from around 100,000 in the 19th century," explains Richard Lair, Advisor and Foreign Affairs Officer at the Thai Elephant Conservation Centre. "Elephants are intelligent creatures and enjoy interacting with humans. They are quick to pick up polo playing skills and in some cases have outwitted the players!" The event is hosted by the Anantara Resort and Spa, a 5-star spa retreat nestled on the sunrise shore of the Gulf of Thailand, 150 miles south of Bangkok. The scenic village of Hua Hin is one of Thailand's least known and least spoiled resorts, popular with both the Thai Royal Family, whose 'Far From Worries' summer palace is there and Thailand's high society for whom it is a gentile weekend retreat within easy reach of Bangkok. Nightlife is minimal, the casuarina-fringed beach slopes gently into shallow waters where colourful fishing boats line the shore and grand temples vie with botanical gardens, a bustling night market and six championship golf courses. The elephant orchestra and famed elephant artists will also be performing and painting each day of the tournament with elephant artworks being auctioned at the Gala Dinner to be held on the 22nd September at the Anantara Resort and Spa. All proceeds will go to the Thai Elephant Conservation Centre. The Anantara Resort and Spa is offering a special jumbo package for elephant or polo lovers interested in coming to see the tournament. Priced at US$755++ per couple, the package includes 5 nights' accommodation including breakfast, 2 tickets for the Elephant Polo Ball on 21st September, admission to the VIP tent at the ground on all days, complimentary transportation to and from the elephant polo ground and late checkout until 8pm on the 22nd September.